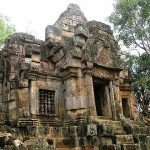 Do not hesitate if you want to have a true Cambodia Adventure tour. 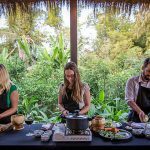 Spend one week exploring all of the Cambodian spotlights including amazing sightseeing and interesting activities. Become an adventurer to unlock the hidden charms of this gorgeous country. 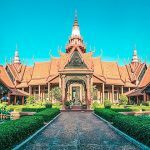 Once you step your foot at the Phnom Penh airport, you will be met by the friendly local guide who will take you to your hotel. On this first day, you should stay in a hotel for taking a rest before joining in the nightlife after dinner. The nightlife in Phnom Penh is extremely lively. Especially in happy hours, tourists may easily have a drink with affordable price. However, don’t stay too late outside because you may have a busy on the next day. Welcome to Phnom Penh city tour. Morning pick up by the local guide after your breakfast at the hotel. 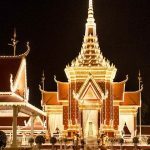 Start your tour by a village to the Royal Palace and the National Museum of Khmer Arts as well as Silver Pagoda and the Royal Pavilion. 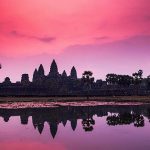 In the afternoon, we will explore the dark side of Cambodian history with visits to the infamous Killing Fields and the notorious Khmer Rouge prison Tuol Sleng. 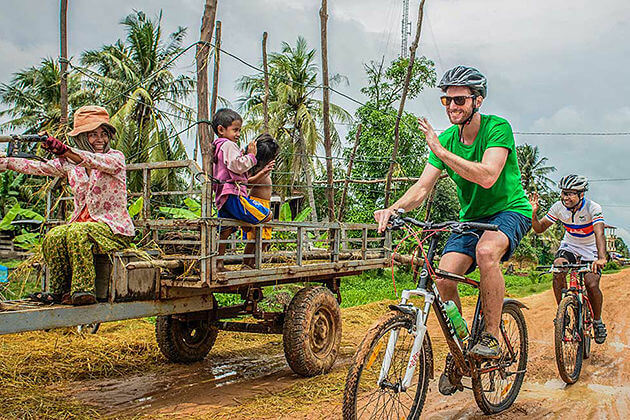 When the bus arrives in Battambang, the tour guide may pick up you and start your third day in your adventure tour. Check in your hotel and have your breakfast at the hotel. 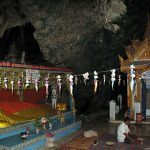 There are numerous things to do in Battambang, our recommend itinerary on this day challenges yourself with a unique Bamboo train in the morning, Killing Caves and then Bat Caves in the late afternoon. One trip in Bamboo Train takes 1 hour. The most exciting experience is when you see a train coming at you from the reverse direction on the same rail with you, don’t too worry, you just need to hops off and lifts the frame and the wheels up and takes off the track, then wait for the train passes and put your train back, you may be on your way again. All in 30 seconds. 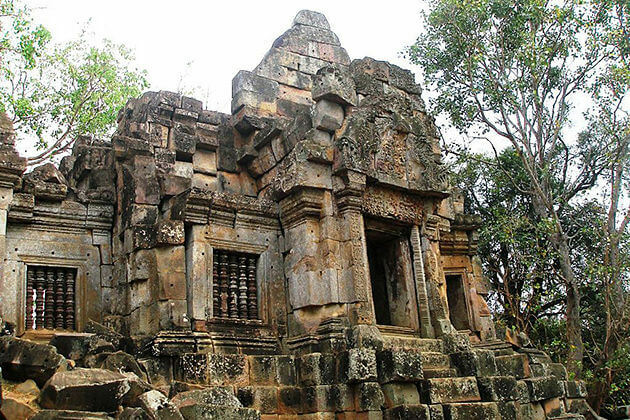 Killing Caves give tourists a great chance to learn more about the history of Cambodia. 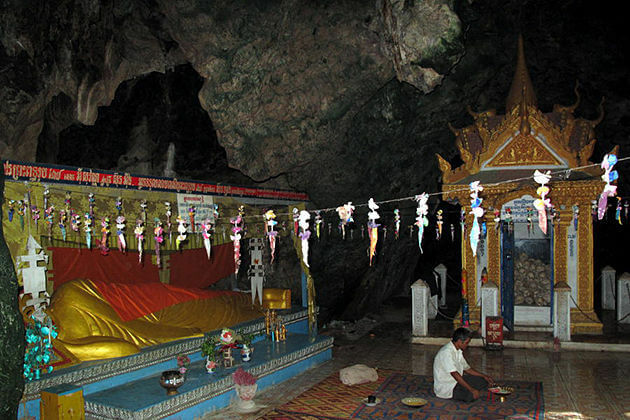 This is a place where people were taken and bludgeoned to death then thrown down into the cave. The best scene in the Bat Cave is when over 7 million bats living here all fly out of the night at around 6 pm. You should be here at 5:45 for the best seat with a cup of cool beer. 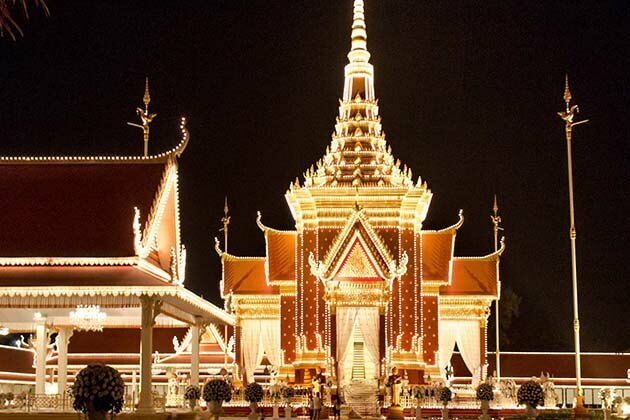 After breakfast at the hotel, take a visit to Wat Ek Phnom with your warm tour guide. Bring enough water and sunscreen to get a break from the heat and sun. 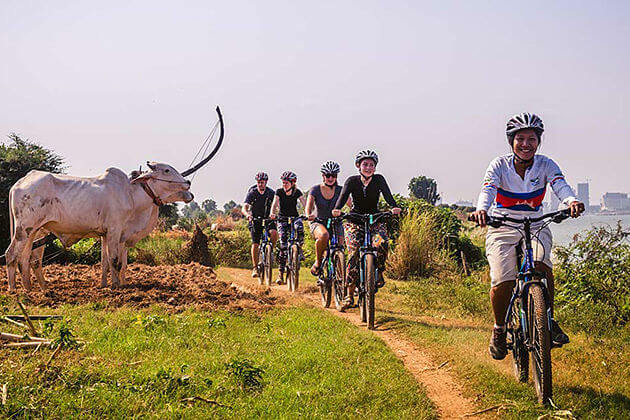 Take one-hour riding to get to Wat Ek Phnom and walk around to enjoy the peace and quiet. Come back to your hotel to get ready for transfer to Siem Reap by private vehicle for 175km in 2 to 3 hours. You may arrive in Siem Reap in the late afternoon. After check-in your hotel, head to Angkor Night Market in downtown Siem reap for shopping. 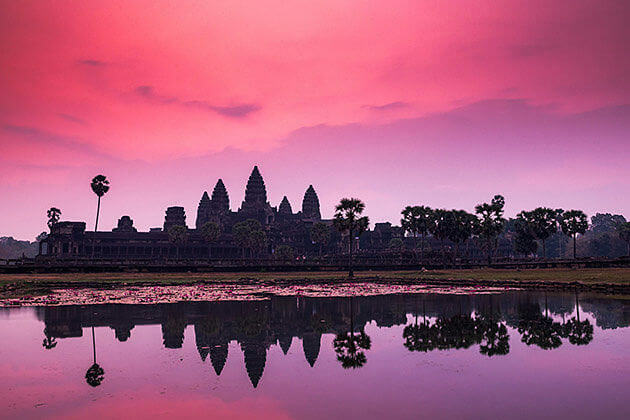 Wake up very early in the morning, then visit Angkor Wat to see the sunrise. Spend the whole day to explore the Angkor complex with a local guide. Then, at around 5 p.m, head back into the site for sunset and a little more exploring. In the next morning, travel to Kratie by private vehicle. 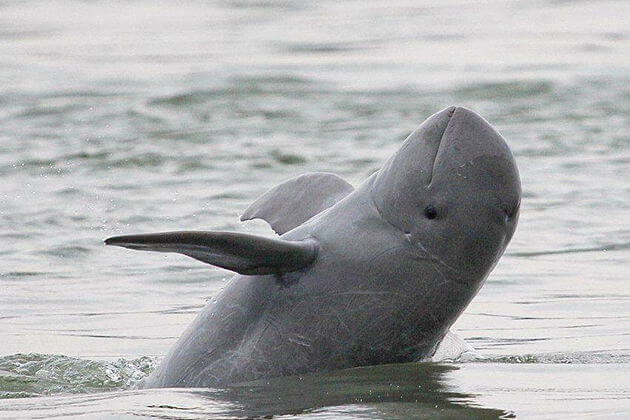 Head out on the massive Mekong with local boatmen to see the endangered Irrawaddy freshwater dolphin. 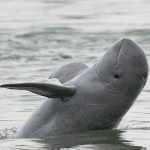 A pod of these small dolphins inhabits in a stretch of the river that is approximately 15km north of Kratie in a village called Kampi. Transfer to Kampong Cham, the third largest city in Cambodia by private vehicle. Rent a bike and cruise along the rive to discover the countryside and meet numerous friendly local people. 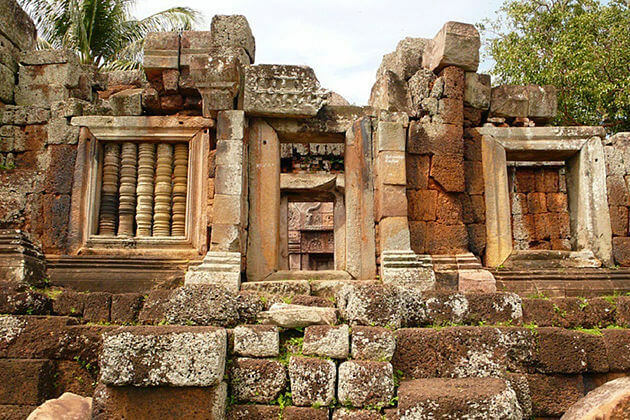 Then visit the Vat Nokor temple from the 11 century. 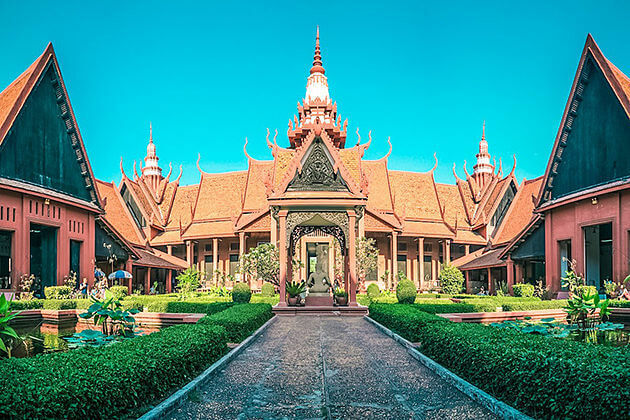 Comeback to the vibrant capital of Cambodia, Phnom Penh. 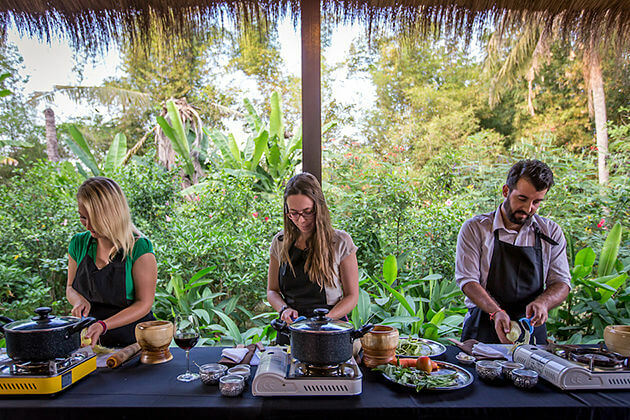 Relax at your hotel or take part in a cooking class to learn more about the cuisine, culture, and customs of Cambodian people before transfer to the airport. Your vacation ends.